You'll need a roller (a regular rolling pin is fine, but I have this nifty wee roller which is handy for small amounts); a knife; a small flower cutter; some foam; a toothpick; and a ball tool (basically a bit of plastic with an orb on the end). In all cases, if you have something else that will do the job, use that - regular foam can be covered with gladwrap if not made for making edible things on, and a careful thumb will do the job of the ball tool - but if you're trying to build up your collection of decorating tools you should be able to find what you need on Kiwicakes, Torte or Cakestuff, or at your local Spotlight or cake decorating store. If you want to make coloured roses you can tint the fondant using gel colour - you'll only need a tiny bit; the amount shown on my toothpick below is all I used to get very pink rosebuds. 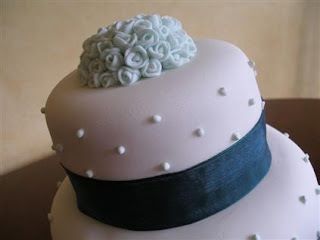 Or if you prefer you can leave the fondant white. If you're using colour just keep folding the fondant in your hands until the colour is even. If you're making a large number of roses it pays to do a bit more icing than you think you'll need, as matching the colour later can be pretty tricky. When you're happy with the colour roll a small piece out (cover the rest with gladwrap as you work) and cut a few flowers with the cutter - not too many at once as they'll dry out before you can shape them. Take a flower, carefully cut a small incisions between the petals - about 3mm in size. Place the flower on the foam and use the ball tool (or your thumb) to gently round out the middle of each petal. You just roll the tool/your thumb around the middle of the petal until it starts to curl up a little. If at any point you feel it's not working out just start over - fondant is a forgiving medium. Pick up the flower again and cradle it gently in your hand. Stick a toothpick through the centre (make sure it goes between your fingers, I don't want you impaling yourselves!) and make a small, teardrop-shaped centre out of fondant. Put this on the end of the toothpick and move the flower up. You want the flower to stick slightly to the centre - it'll make life easier - and depending on humidity this may happen by itself, but if it doesn't just dab a drop or two of water on the flower with a small paintbrush or your finger. Wrap one petal gently around the centre. For the second petal, take one from the opposite side - not adjacent to the first one. Wrap it around and repeat for the remaining three petals. Voila! You have a cute wee rosebud. I often find at this point that the flower is a bit too long, so often pinch some of the icing off the bottom (being careful not to squeeze the petals). If you are making a wedding cake topper - or any fondant decorations - you can make them ahead and just store somewhere dry and cool (but not the fridge) until you need them. The fondant will harden but will still be fine to use and eat. Trust me, if you are making a wedding cake the more you can do in advance the better! For less weddingy baking you can just pop a single rosebud or a small cluster atop a cupcake - if you have a leaf cutter you can add leaves for authenticity. Once dry you can paint a little edible glitter or shimmer on if you wish - and if you want to you can keep your rosebuds for months until you need them - just store somewhere cool and dry where they won't get broken. Fun fact: the wedding cake above was three tier and the middle tier was lolly cake! Did you (or would/will you) have interesting flavours for your wedding cake, or do you like the traditional fruit? Are you getting married,or as you are called Mrs Cake is my question redundant? Yes I know,I'm a nosey parker!! Wow! The toppers (and cake!) look so impressive but seem really achievable with the step-by-step pics. The individual buds are so cute too. I love your how-to posts. Thank you! Kat, definitely give it a whirl - and your cake sounds nice and varied, great to have options for everyone! It's so lovely that you share how to make these. Thank you!